Home > Lifestyles, Mountains	> It’s All Downhill From Here. Having had a very rough 2011, I turned 54 yesterday and I greatly appreciate all of the well wishes. New friends can always join me on my FaceBook Photography Page which can be found at http://on.fb.me/dFOCUU. Coincidentally, I also read a blog yesterday on WordPress’s Freshly Pressed http://bit.ly/nI1ORa claiming that photographers create their most influential work between 20 and 45……Not. Although the writer is a very well-respected Fine Art Photographer, Alec Soth, to me, age knows no photographic limitation. Heart, vision and soul can be exhibited at any time in your life. In my case, maturity has increased my photographic insight and patience. Looking through some of my older work recently, I realized that much of it was good, but predictable. Although my images were often published editorially in the past, it is only since 2008 that I have sought (and gained significant) recognition in the Fine Art Photography world. So much for the argument that my best photographic years are behind me. This particular image was created on New Years Eve 2007. 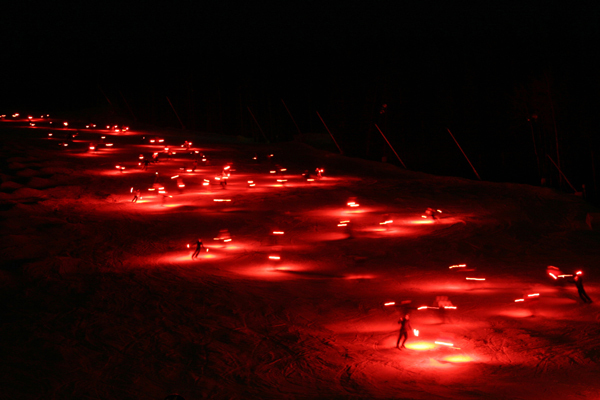 Waiting at the bottom of the ski run, at the countdown to 2008 skiers dressed in black and snaked down the mountain carrying red flares. To capture this image required a tripod and fast shutter speed. Stopping the action with just a slight blur to show motion, while using only the available light from the flares, was definitely a challenge (for a photographer of any age). That being said, I plan on creating unique and interesting images for as long as I can see and carry a camera. Notwithstanding that which I may have been dealing with in 2011, in 2012 and beyond I seek to continue on a prolific photographic path, and to accomplish that I have to believe …it’s all downhill from here.